As did a few clubs in the championship who brought bigger away supports that you will bring on Saturday and I think Simon maybe a bit short on his calculations. can understand reasons for segregation but always pish not getting behind the goal we’re attacking and not exactly much room to squeeze up at the segregation fence. Views are perfect from the stand behind the goal. Iv no problems at all with segregation. Think you are underestimating a fair bit. Officially, David Will Stand holds 1,228 - there won’t be that many unusable seats to take it below 1,000. Hedge side holds 1,168, of which you have the majority and the space at the other side beside the dugout holds 170. Like a couple of previous posters have said, we had St Mirren and Dundee United at the Glebe last season who brought more than I expect from Arbroath. Perfect time for me to dust off the old golf sticks I think . Lets do this boys no messing about, straight from the kick-off, same as the last time we played there a magnificent 5-1 victory. AFC support lets get behind the team from the off. 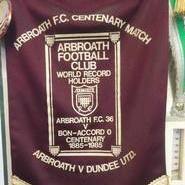 arbroath will bring about 1800 if its not raining. AFC360PUNK1320 will dissolve if he gets wet, He also doesn’t do crowd wa* nks. Ok, asking for a friend who is the gaffer of a pipe band, if we win on Saturday, when will we be presented with the trophy, the pipe band are buzzing and want to repay the good folk of Arbroath and surrounding for their support, would it be next home game against Raith Rovers or last home game for the season against Dumbarton, thanks. Agree with 23. Would imagine the big trophy celebrations on final day. Well I flaming hope so, had 4th May pencilled in for a jaunt to a party at Gayfield. Would be really cheesed off if it happens at any other game.